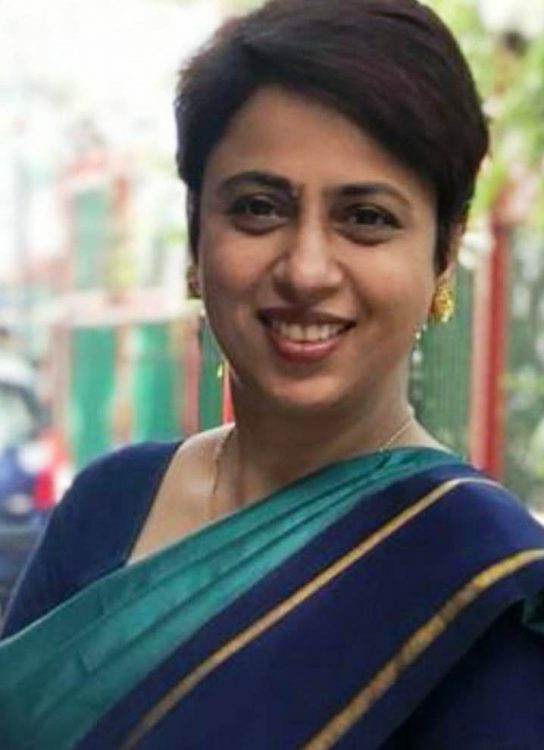 She is a trained chef from the Institute of Hotel Management, Catering Technology and Applied Nutrition, Mumbai and has been a food consultant to the Times of India (India’s largest media group) creating menus for celebrities such as the deputy Prime Minister of India as well as several top film stars. After her short professional stint in Mumbai, she moved to England and worked at the Bombay Brasserie(a Taj Group restaurant) in London.Soon, she met her literary agent, and through her, her publisher, Kyle books, one of the UK’s leading publishing houses. 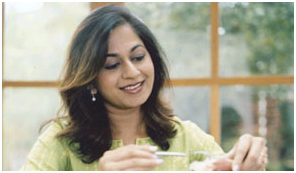 They commissioned her first book, ‘The Indian Kitchen’, which went on to win several awards. She was then commissioned to write her second book. From the books, there came TV and her cookery school. Since she has studied history, she also gives lectures on food history. The success of one book led to the other and she has written 15 books. 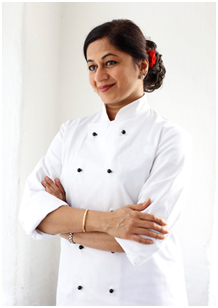 Chef Monisha was born in Mumbai and attended the Bombay International School and then St Columba School. Her junior college was HR College of commerce after which she joined the Institute of Hotel Management, Dadar in Mumbai, India. She started her training in Bharatanatyam at the age of 4 and has studied this classical dance form for 30 years. She has performed all over the world professionally, and was invited to perform at the opening of the Nehru gallery, Victoria and Albert museum, in the presence of HM the queen. She has created and taught her courses at other cookery schools such as Divertimenti, The Bertinet Kitchen in Bath, The Ashburton School in Devon, seasoned in south Derbyshire and The Bristol School of Food and Wine. She teaches several classes a week, from training chefs from all around the world to teaching people with special needs. Her specialty being the Indian Cuisine, she feels that India and Indian food is so diverse, it has got its roots in many different aspects in different regions. One should understand that Indian cooking is easy to do and focuses on good health. One can keep it simple by using locally sourced ingredients, which are in season. She believes that turmeric is the ‘super spice’ since it has antioxidants, is anti- inflammatory; making it a wonder spice. She herself loves turmeric tea and has been having it for many years; she believes that it has kept her immunity high. 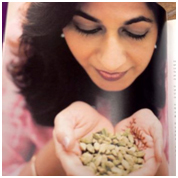 She was invited to be a part of the BBC radio 4’s programme, ‘The food programme’ on turmeric last year. She feels that physical stamina is extremely important for chefs as they have to spend a lot of time workingand standingin hot kitchens and small spaces. The physical demands of the job are many.Her success mantra for a professional chef: “Be good at teamwork, have appropriate knowledge and skill sets with a wish to keep learning and innovating”. 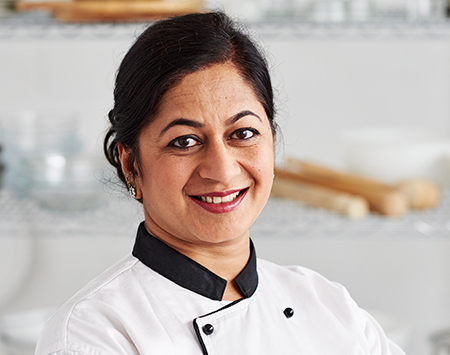 Shehas been a guest chef at Benaras, a Michelin star restaurant in London and at the Intercontinental Hotel, Park Lane.She is often invited to judge food events and has been a regular judge at the Guild of Fine Food’s ‘Great Taste Awards’ for the past few years. In 2013, she was invited to be Guest Lecturer at SOAS, University of London, to give a series of talks on ‘The History and Culture of India through its Food’. She was invited to be guest speaker at Kew Gardens for the Indian Orchid Festival 2017 where she talked about healing plants used in Indian cookery. In 2017, Chef Bharadwaj developed and gave a lecture on ‘How the British Fell in Love with Curry’ at The British Council. More recently, in 2018, she was invited to bethe brand ambassador ofVeetee Basmati rice in the UK and Europe. She says, “Today, everyone considers curry a national dish in the UK. It started with the East India Company as returning officers and wives took back recipes from India. However, the right ingredients and tools were not available, and so the British used substitutes and British cooking techniques to cook Indian dishes. For example, they used apples instead of raw mangoes.As time went on, more Indians came to the UK, started their own restaurants. Bengali boatmen, who were taken back by the British, started working in the fish and chip shops. This is where they started cooking curry, which white men discovered, was a good meal to have after a few beers, given that curry was spicy!”. She was awarded ‘Cookery Writer of the Year’ in 2003 and her books have been shortlisted for awards such as the Cordon Bleu World Food Media Awards, the Andre Simon Award and the Jacob’s Creek World Food Media Awards. She has also won the prestigious food award from the Deutschland Akademie Ausgezeichnet in Germany. Her books have sold almost a million copies in 8 languages. She contributes to several magazines and newspapers such as Elle, Delicious, The Mail on Sunday and the Sunday Telegraph and has cooked on TV for Great Food Live and Bites on UK Food and for the South African Broadcasting Channel. She has been a judge on Iron Chef America (The Food Network, USA) and cooked for ‘Chef on a Shoestring’ (CBS Network, USA). She has also done BBC’s ‘Food and Drink’ show and ‘Inside the Factory’, ITV1’s ‘The World’s Best Diet’ and Sky One’s ‘Fat Families’. She has also been nominated ‘celebrity chef of the year 2018’ by the London curry awards.